"Incontrovertible" test results show sarin gas or a similar substance was used in the chemical weapons attack in Syria earlier this month, the Organisation for the Prohibition of Chemical Weapons (OPCW) says. Samples from 10 victims had been analysed at four laboratories, OPCW head Ahmet Uzumcu said. The attack on rebel-held Khan Sheikhoun killed at least 87 people. 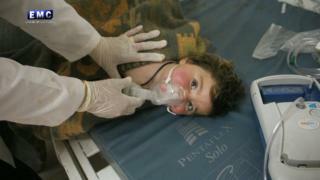 The Syrian military denied using any chemical agents. Its ally Russia meanwhile said an air strike hit a rebel depot full of chemical munitions - but this suggestion has been widely rejected. The US responded to the attack by launching air strikes on a Syrian military airfield. Why was Shayrat airbase bombed? Footage following the incident showed civilians, many of them children, choking and foaming at the mouth. Mr Uzumcu said samples had been taken from three people who died in the attack and were analysed at two OPCW designated laboratories. Another set of samples from seven people being treated in hospitals were also analysed in two other laboratories. "The results of these analyses from four OPCW-designated laboratories indicate exposure to sarin or a sarin-like substance. While further details of the laboratory analyses will follow, the analytical results already obtained are incontrovertible," Mr Uzumcu said. An OPCW fact-finding mission was ready to deploy to the town if the security situation meant it was possible, he said. The team was continuing to conduct interviews and collect samples, he added. Syria had been obligated to give up its chemical weapons arsenal under the terms of a deal agreed between the US and Russia in 2013 following a deadly chemical weapons attack in Damascus earlier that year. The UN said sarin had been used in the attack which killed hundreds of people in the Ghouta agricultural belt to the west and east of the capital.